after a long and stressful week i crave a nicely chilled cocktail! when i saw these "21 & over" popsicles i thought it was genius! it's definitely a clever way to enjoy a cocktail...especially during the summer time. well..if you've got a mini bar at home i'm sure you already have some of these ingredients! all you need is a popsicle mold (and a freezer of course) and you are good to go!! so if you're having people over for the weekend or just want to enjoy a ice cold cocktail give one of these a try (i sure know i am - lychee raspberry saketini to be exact)! p.s. if i could host a happy hour on the blog...i so would! at least we can pretend, right? so, let's all pretend we have a popsicle in hand and cheers to the weekend!! looks so refreshing, def wanna attempt the fruit ones! xO! Yum! I want to try all of them! Did you say "happy hour on the blog?" I'm in! Will you hand me the white sangria, pretty please. 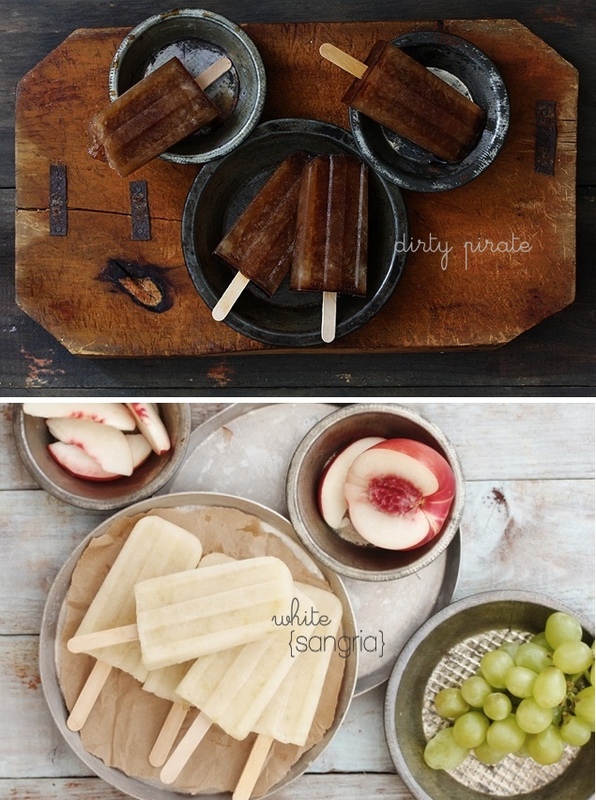 Gosh, the photos make all these popsicles look so good. Have a wonderful weekend, Jin! Cheers!